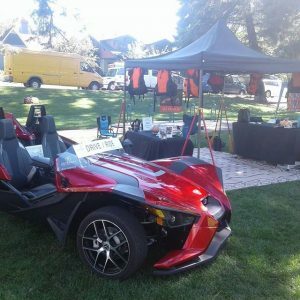 Outriders NW Tours is pleased to offer brand new 2019 Polaris Slingshot for your on road adventures around Bend and the Cascade Lakes Highways. Oregon Helmet law requires helmets on drivers and passengers.DOT approved full face helmets are included with all rentals. The State of Oregon classifies Slingshot as an autocycle, which only requires a valid driver’s license. A motorcycle endorsement is not required.Our insurance requires that all drivers are 25 years or older.The Driver must be able to operate a manual transmission. Slingshot’s lightweight design and 173 HP provide an impressive power-to-weight ratio.